Summer is on it’s way, and below are some beneficial food and drink ideas. 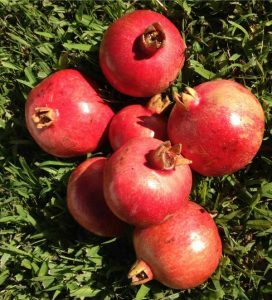 Pomegranates (Punica granatum) have been in season and we have been enjoying the fruit, and even more so, as we read about the health benefits. Pomegranate is a small tree, which can be pruned to keep to shrub size, thereby making it suitable for small gardens. The tree is deciduous in winter thereby making it suitable for cold climates. The pomegranate fruit is such a beautiful red colour and keeps a number of weeks when picked and can be eaten fresh in hand, used as a garnish, added to fruit salad, desserts, sauces, jellies, syrups, etc. The juice is a rich source of antioxidants, which researchers say, can keep bad LDL cholesterol from oxidizing. The build up of LDL may lead to the development of atherosclerosis. In addition, pomegranate can help keep blood platelets from clumping together to form unwanted clots (providing a similar action to aspirin, but without the side affects). Pomegranate may reduce the risk of having heart attacks, strokes and Alzheimer’s disease. This fruit is high antioxidants and thus helps support the body’s normal defense in the prevention of certain cancers. One of the most dreaded consequences of cancer is when the disease metastasizes and spreads from the primary site where it started, to other parts of the body. Natural News, reported findings of scientists at the University of California, that components in pomegranate juice have been found in research, to inhibit the movement of cancer cells and weaken the attraction of malignant cells to a chemical signal that has been shown to promote metastasis. An Israeli study has demonstrated the fruit’s potential to fight and prevent infection. Researchers discovered that patients with kidney disease who are undergoing dialysis can considerably reduce their likelihood of infection by drinking just a few glasses of pomegranate juice a week. Pomegranates have a very high content of punicalagins, one of its potent antioxidant components, found to be a valuable health benefit. Pomegranate is also a source of resveratrol, a powerful antioxidant that is found to slow the ageing process. Resveratrol also benefits the nervous system and is valued as an anti-cancer factor. These combination antioxidants, plus vitamins and minerals in pomegranates, provide a powerful synergy, that prevents and reverses many diseases, researchers indicate. 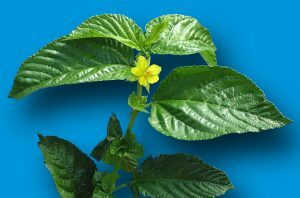 Alehoof (Glechoma hederacea) a perennial ground cover herb and trailing stems, with attractive scalloped kidney shaped leaves 4-5cm in diameter, and blue two-lipped flowers. The herb has had many traditional folk-lore uses as a tea for indigestion, fevers, headaches, jaundice, gout, arthritis, normalizing heart beat, stimulating circulation, as a strengthener to liver, gall, kidneys, glands, spleen, sciatica, vertigo, ringing in the ears, persistent coughs, and to prevent premature ageing. 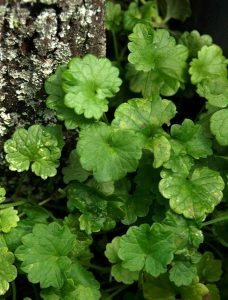 The herb was held in high esteem as a wash for treating the eyes, whether it was for black eyes, inflammation of watery eyes, conjunctivitis, spots or failing eyesight. Drink alehoof in summer for heat fatigue. Leaves and flowers can be used in meals and as a garnish. Purslane (Portulaca oleracea) is a valuable survival food plant, to get to know and eat regularly. It just may be a weed growing in your garden or on footpaths in your neighbourhood; just like in the picture below of a plant growing in a crack in concrete. Eat the leaves in salads, sandwiches, added to cooked dishes near the end of cooking, whizzed up with other greens in smoothies, and I often use in making pesto. 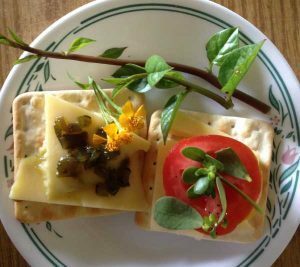 Picture below shows a purslane sprig used as a garnish on a sao savory biscuit with tomato slice. Also displayed on the plate, sao biscuits with cheese, gherkin pickles, sweet tarragon and red stemmed Ceylon salad leaves. 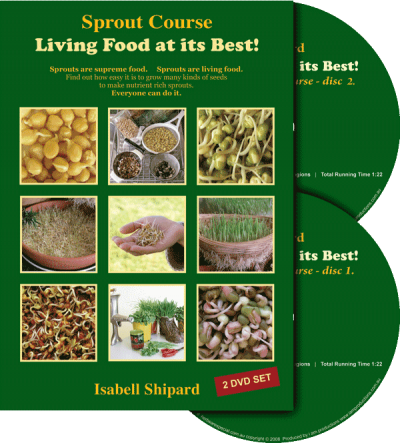 How can I be prepared with Self-Sufficiency and Survival Foods? Scientific discovery in 1980, found that purslane is a valuable source of omega-3 essential fatty acids (EFA), means we can have our own rich source of EFA in the garden. For more information on the value to health of EFA refer to my books “How can I be prepared with Self-sufficiency and Survival Foods? The purslane leaves are mild in flavor, slightly sour, mucilaginous, and an excellent source of vitamins A and C, also iron, calcium, potassium and magnesium. 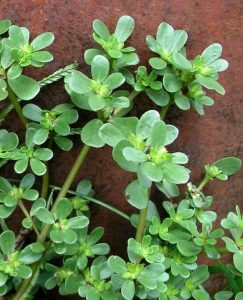 The website of the Association of Women for the Advancement of Research and Education states: Eating 5 sprigs of purslane 10cm long daily, provides over 550mg of calcium. A great nutritional benefit to the bones for any one from toddler to later years. A report from NaturalNews stated that diabetes continues to grow at a staggering rate with 1.6 million new cases being diagnosed each year in the US (no doubt Australian figures are similar). Emerging evidence, now clearly demonstrates, that this insidious disease can be prevented and controlled with a diet naturally high in green leafy vegetables. The results of a study published in the BMJ (British Medical Journal) reviewed six studies covering more than 220,000 people, concluding that one and one half servings of green leafy vegetables per day lowered the risk of Type II diabetes by 14%. We all need to be mindful of the benefits of greens in our daily diet. Let’s all add more salad greens to our plates this summer. Great ones to grow and use are watercress, salad mallow, sheep sorrel, lebanese cress, rocket… to name a few. For more on salad greens, download ‘Delicious Salads’ PDF. Sprout 2 tablespoons of sunflower seeds (use seeds still with the husk on) on a shallow seedling tray (or even an opened up egg carton) filled with potting mix or soil approximately 2-4 cm deep. 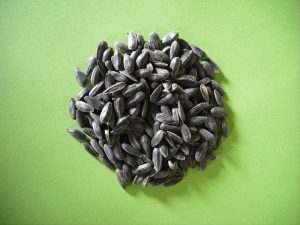 Start the sunflower seeds by soaking in water for several hours, and then spread over the prepared soil. Cover with 5-6 sheets of damp newspaper and leave to germinate. When seeds start to sprout, remove newspaper. Check the soil daily and water as required. Sunflower sprouts will be ready to pick, by cutting at soil level, when the first 2 leaves turn dark green, which can be from 6 to 9 days, depending on day and night temperatures. Then you are ready to make the salad. If you can’t wait to sprout the sunflower seeds to use the sprouts, the recipe can also be made using hulled sunflower seeds. Mix all together and serve for a very tasty and nutritious salad. 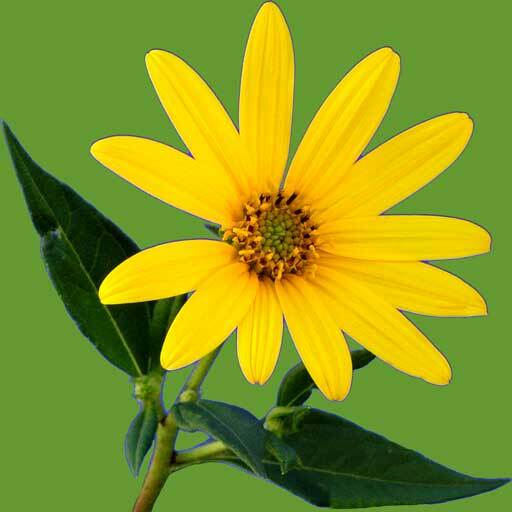 You can read more about these wonderful plants and recipes in Isabell’s books. Your herb book is wonderful. It is the most used book in my library. I find myself constantly referring friends to it, and I don’t like to lend it out any more, as I get a little stroppy when I can’t put my hands on it when I want it. I have decided to write, as a follow up to reading your magnificent herb book. Actually I may be forever reading your book, as it so comprehensively covers its subject matter. It truly is the best that I have found and it is like a herb bible for all of us learning about what herbs are about. So, thankyou for such a marvelous body of work. I bought a herb book from you last year. The detail, hints and “how to do” throughout make this book a treasure to own. Now, I would like to order a book to give to my daughter who uses herbs regularly. I have an interest in self-sufficiency and well-being; for me this book is worth its weight in gold. Your book is a whole combined package, unmatched by other books. I have found the book very captivating, covering so many useful plants. One can get a very good picture about the garden of Eden and the gifts that mankind was given to use and enjoy. Dear Isabell, I am ordering 7 Sprout Books. I look forward to receiving them for myself and for gifts. I keep your Herb Book always within easy reach! I ordered your herb book a few months ago and must say that it is the most valuable book in my library. This book totally replaces all the other books I have on herbs. The amount of information on each herb is amazing. Not only will this be an invaluable tool in the creation of my herb garden and in the health and well-being of my family, but also for my animals who suffer just as much from the processed foods and pollution of today. Dear Isabell, Fantastic book you have produced! Congratulations. It will be a reference book for many, many years. Well done. Could you please send us another 5 copies. I am a member of Brisbane Organic Growers. “How can I use Herbs in my Daily Life is always on sale at meetings. All who purchase it agree it is the most wonderful and comprehensive book on the subject. It makes all other herb books obselete. 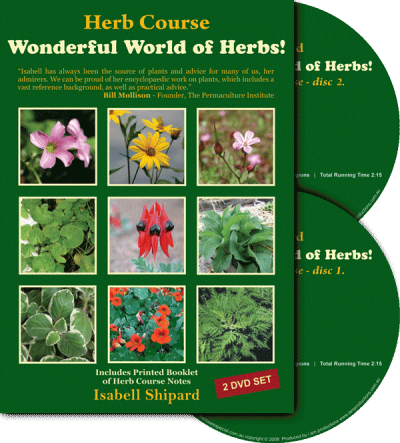 Hello Isabell, I have recently purchased your fantastic, fabulous and wonderful herb book. I am currently studying full time for Bachelor of Health Science with a major in herbs. I am enjoying your book so much. It is one the most comprehensive books I have come across. I recently bought the Herb Book and have found it packed full of valuable information. I believe this book is a must have for any health conscious person. 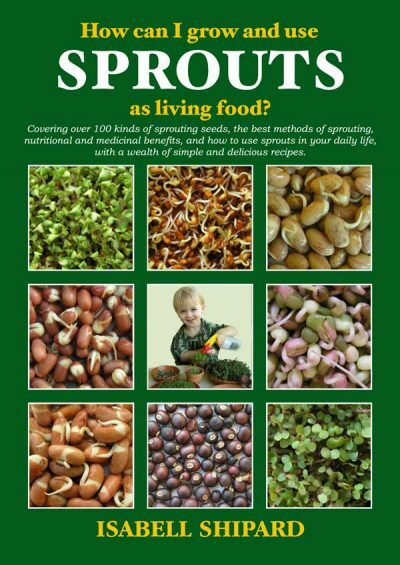 The sprout book is fantastic, just like the herb book. Such valuable information for everyone. I love and treasure your book. It was given to me by a friend and I constantly read and refer to it; thankyou, thankyou, thankyou for making it available. Truly magnificent would be the best way to describe the herb book. Your herb book is the best book on herbs I have come across. The Herb Book is the most wonderful herb book I have ever seen, It has become a daily reference book. Dear Isabell, I want to thankyou very much for this WONDERFUL book on herbs. So much information that I have been looking for and wanting, it's fabulous. I just did my Permaculture Design Certificate with Bill Mollison and Geoff Lawton and they were so enthusiastic about your book that I had to get it, even though I already own about 12 books on herbs. Congratulations on your herb book. It is very well put together and it is our prime reference manual, and we recommend it to whoever will listen. I bought your book 2 years ago and have thoroughly enjoyed it and am always lending it out. It is such a practical guide, that I now would like to order 5 books to give one each to my 4 daughters and 1 son, who I am sure will enjoy it as I have done. I got the herb book for my birthday two years ago and still find it the best source of useful information of any herb book I have, in fact, more useful and better written than the lot combined! 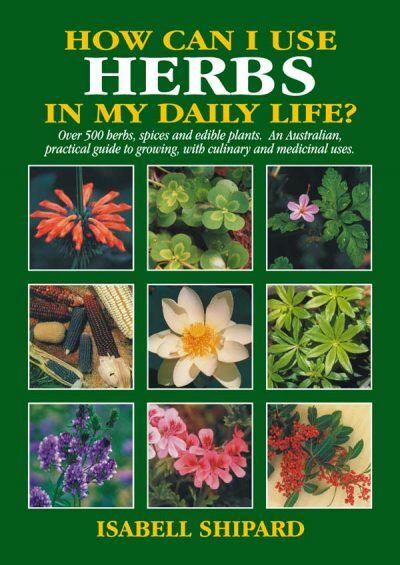 Your book “How can I use herbs in my daily life?” has caused me many sleepless nights, for which I am eternally grateful. As reading and re-reading and then reading again, brings more interest, information and delight, I feel like a child let loose in a lolly shop. The sprout book is great and I have just started reaping the benefits of our first crop of sprouts, and I can honestly say that I have been mesmerized by the amount of information in the herb book. Both books are fantastic references. Please email sales@herbsarespecial.com.au if you have any questions or problems ordering online. Thank you. How can I use HERBS in my daily life? 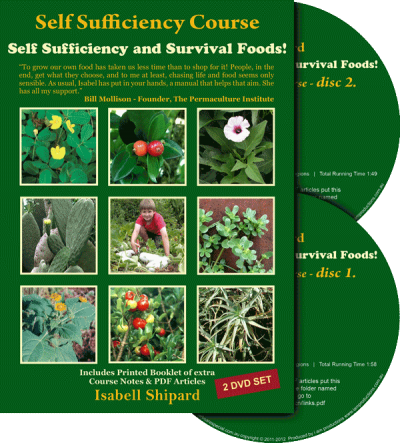 How can I be prepared with Self-Sufficiency and Survival Foods? How can I grow and use Sprouts as living food? Living Food at it’s Best! 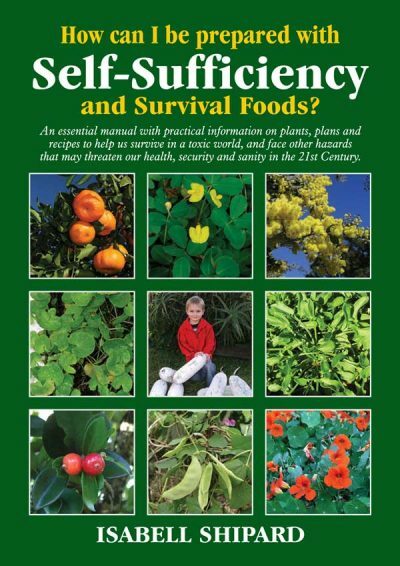 Self Sufficiency and Survival Foods! 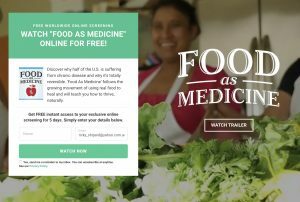 fmtv.com has a new documentary that you can watch online for free for the next 3 days. For a limited-time FREE viewing of this ground breaking 9-Part documentary series. Dr Hyman is a practising family physician, an​​11-time New York Times bestselling author speaker, educator and advocate in the field of Functional Medicine. He is the Pritzker Foundation Chair in Functional Medicine at the Cleveland Clinic and Director of the Ultra Wellness Center, chairman of the Institute​ of Functional Medicine, medical editor of the Huffington Post, and a regular medical contributor in the media for CBS This Morning, Good Morning America, CNN, The Dr Oz Show and more. Dr. Mark Hyman is a practicing family physician, a 11-time New York Times bestselling author, and an internationally recognized leader, speaker, educator, and advocate in the field of Functional Medicine. He is the Pritzker Foundation Chair in Functional Medicine at the Cleveland Clinic Lerner College of Medicine and Director of the Cleveland Clinic Center for Functional Medicine. He is Founder and Director of The UltraWellness Center, chairman of the Institute for Functional Medicine, medical editor of The Huffington Post, and a regular medical contributor in the media for CBS This Morning, Good Morning America, CNN, The Dr. Oz Show, and more. This talk was given at a TEDx event using the TED conference format but independently organized by a local community. providing mental and physical therapy and a bountiful harvest for health and vitality. Can the food you eat grow new brain cells? Sign up to our email list and receive a 10% Off Coupon Code + 3 of Isabell’s Plant Articles for FREE.